9 g / POIDS NET WT. 0.3 OZ. Multi-use, multidimensional highlighting powder brings customizable light to face, eyes and décolletage. Prismatic pigments deliver long-wearing illumination that won't fade or shift. Using different brushes, you can sweep on the level of illumination you want, where you want it. Modern, compact powder has a soft, creamy texture that applies smoothly and evenly and won't ever flake or crumble. There's a Face Illuminator right for every skin tone. Devotion and Indiscretion create a cooler toned highlight, while Addiction and Seduction are warmer. 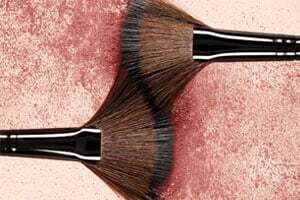 Apply with the Fan Powder Brush and sweep lightly over the skin—anywhere you want a subtle glow. Apply with the Finishing Brush for a sheer, diffused glow, or with the Crème Cheek Colour Brush for targeted, high-beam highlighting. Using a denser brush will pick up more product from the pan, and therefore create more intense illumination. For maximum radiance, apply with the fingertips (the heat of your skin warms the powder and turns up the bright). Use it wherever you want to highlight or illuminate: on the apples of the cheeks, forehead, nose, chin, eyelids and more. A touch of Face Illuminator on the décolletage and shoulders adds a beautiful, allover glow. Mica, Cetearyl Ethylhexanoate, Hdi/Trimethylol Hexyllactone Crosspolymer, Glycerin, Squalane, Octyldodecyl Stearoyl Stearate, Polysorbate 80, Caprylyl Glycol, Ethylhexylglycerin, 1,2-Hexanediol, Chondrus Crispus (Carrageenan) Powder, Xanthan Gum, Pentaerythrityl Tetra-Di-T-Butyl Hydroxyhydrocinnamate, Silica, Dicalcium Phosphate, Synthetic Fluorphlogopite. May Contain/Peut Contenir/(+/-): Ci 77891 (Titanium Dioxide), Ci 77491, Ci 77492 (Iron Oxides). Ingredients Mica, Cetearyl Ethylhexanoate, Hdi/Trimethylol Hexyllactone Crosspolymer, Glycerin, Squalane, Octyldodecyl Stearoyl Stearate, Polysorbate 80, Caprylyl Glycol, Ethylhexylglycerin, 1,2-Hexanediol, Chondrus Crispus (Carrageenan) Powder, Xanthan Gum, Pentaerythrityl Tetra-Di-T-Butyl Hydroxyhydrocinnamate, Silica, Dicalcium Phosphate, Synthetic Fluorphlogopite. May Contain/Peut Contenir/(+/-): Ci 77891 (Titanium Dioxide), Ci 77491, Ci 77492 (Iron Oxides).